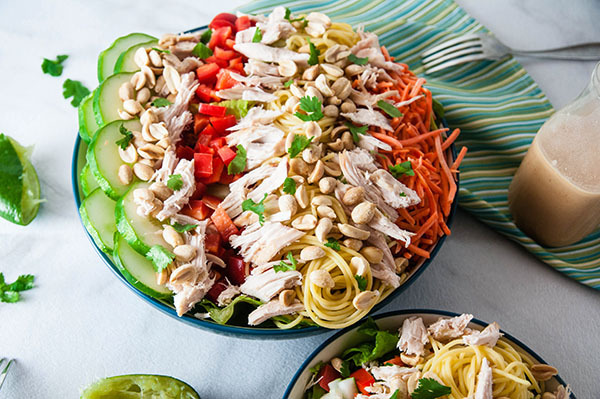 This Thai Chicken Salad is loaded with all sorts of yummy things like noodles and peanuts. MMMMM. And it’s still salad. It’s a salad loaded with a rainbow of color and all the things. Chicken, crisp cucumbers, sweet peppers, cold noodles, and carrots. 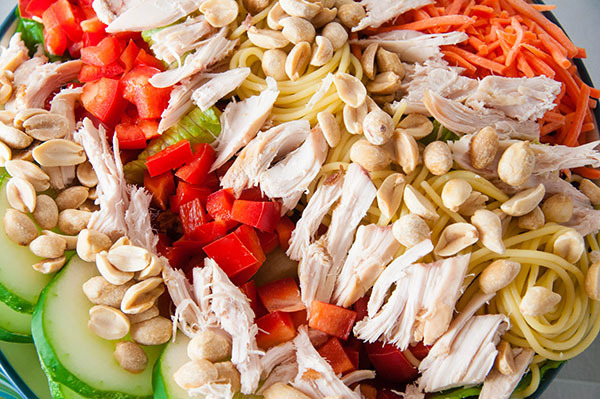 And let’s talk about that creamy peanut dressing. Creamy, sweet, and spicy all at the same time. YES. There has been tons of the crazy food going on here lately like Mozzarella Stuffed Meatball Burgers or (one of my favorites) Stuffed Buffalo Chicken Burgers. A salad was long over due. I do love a good salad. Especially one full of the Thai flavors we love so much in this house. In case I haven’t mentioned, I’m pretty sure I made the Goose with Thai food. I could barely keep any other meal down, but Thai food always stuck. This is probably why I – and the Goose – enjoy Thai food a lot. A. Lot. In fact, I think I may have mentioned it here and here. It does not end up in our dog’s stomach. She eats it very quickly without playing with indefinitely. And it’s so easy to see why she loved it so much. 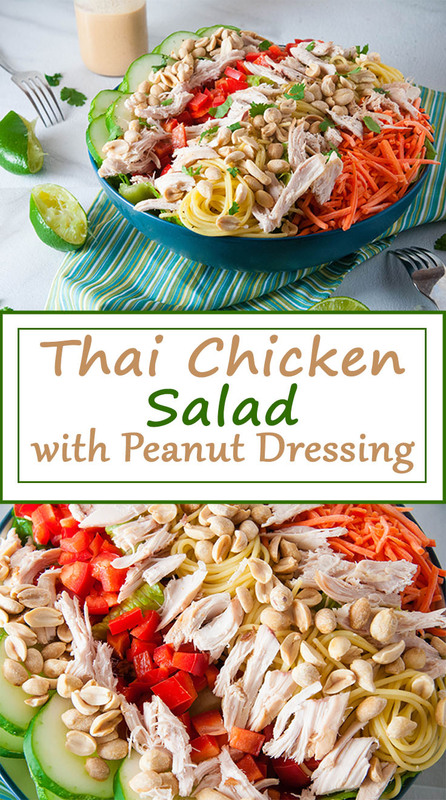 The spicy, sweet peanut butter dressing reminds me of dips we can get at our favorite local Thai restaurant. Mixed with coconut and siracha, it’s got that perfect balance of sweet and spicy. 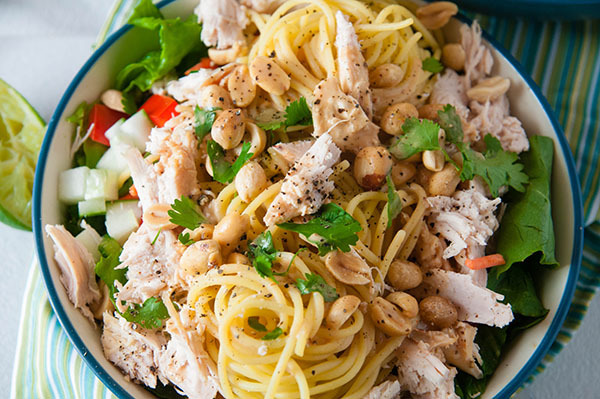 And the protein from the chicken and carbs from the noodles make the salad feel more like a meal. Less like a salad. 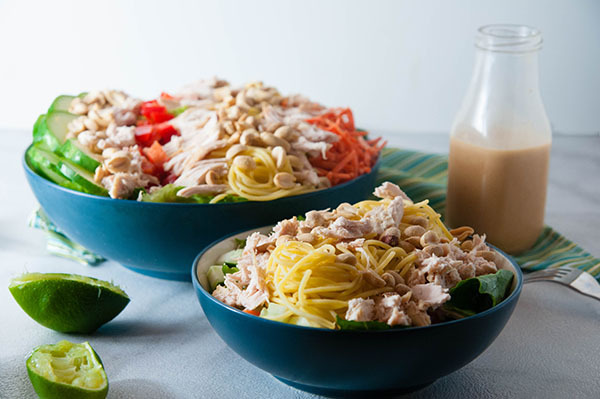 So if you are feeling like Thai, but don’t want to go out tonight, try this salad. It came together in less than 20 minutes and was a meal worthy of a restaurant. What’s your favorite Thai food that you’d like to recreate at home? Sign up to receive email updates and an exclusive unpublished recipe! Boil a pot of water and cook pasta according to the directions on the package. While the pasta is cooking, chop your veggies and chicken and add them to a large bowl. Drain and rinse the pasta in cool water and add to top of salad. Garnish with peanuts and fresh cilantro if desired. Microwave the peanut butter for 30 seconds to soften it. Whisk together with lime juice, honey, coconut milk, and soy or tamari. Finish with curry and ginger. 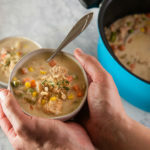 Serve immediately or store in the fridge for up to 1 week. Beautiful photos! 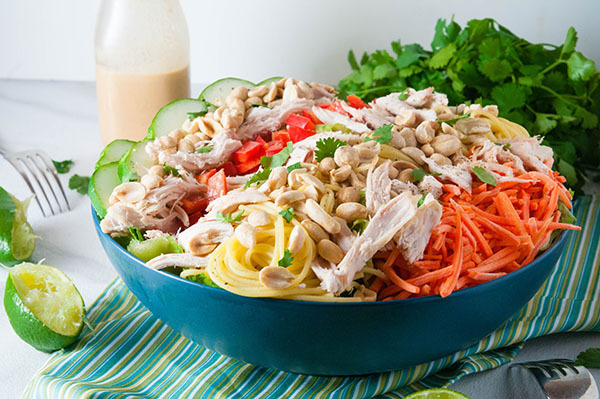 I love eating bright and colorful salads with different textures, and make peanut sauce regularly so I think I would love this! I love salads! This recipe sounds really tasty. I’ll make this salad this weekend. This looks amazing!! 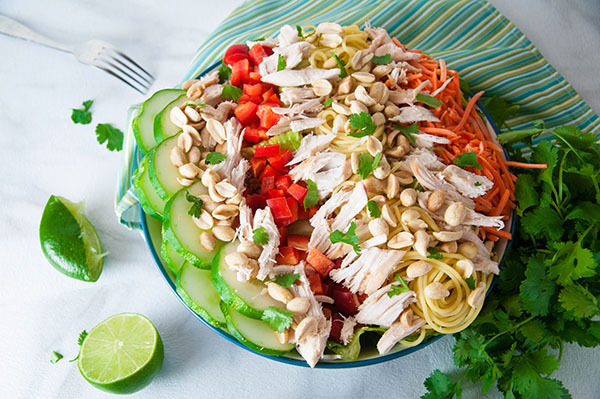 I love Thai food and this salad is perfect for summer!! Looks so good! I’m not a big spicy person, so I’d likely skip the Siracha, but I’ll be giving this a try! You could totally skip the siracha or add just a touch for flavor without heat. Wow! Now THIS is a salad! 🙂 Loving the flavors & different textures happening here. Love Thai and eat too much of it takeaway so this is perfect. 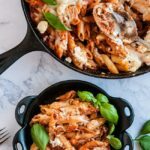 Looks delicious and will definitely look at this recipe next weekend! I think the husband will love it! Thai takeout is my favorite thing in the world. It’s up there with fuzzy puppies and beach sunsets. That’s how much I love it lol. I hope you enjoy this salad as much. Definitely putting this recipe on my list. I’m hungry just looking at your pics! I love big salads with lots of variety – some crunch, some color some protein, some cool & refreshing bits. This looks absolutely delicious. Any recipe with an Asian influence is always up my alley! Cannot wait to try this! I love Thai flavors! 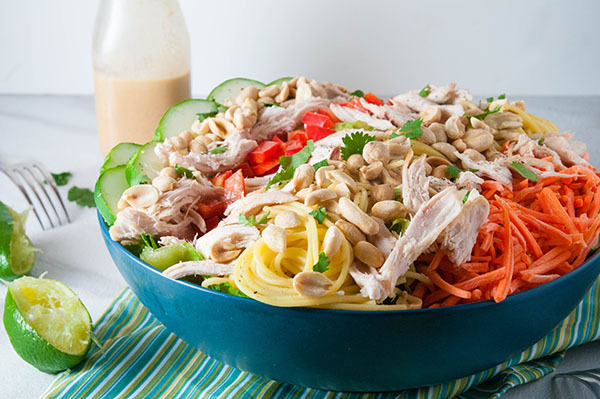 This looks delicious, especially with that creamy peanut dressing. So yummy! Really the dressing is so good. It makes it. I have everything to throw this together. Karma right. Now I have to make this dish. The wonderful ingredients! I wonder which the dressing taste like? Sweet and sour? The dressing is sweet and spicy. Not so much sour. The lime just sort of gives it a freshness. Sounds like a delicious and healthy meal! Going to have to try it out. It is delicious and healthy! Pinned this! I am OBSESSED with thai peanut sauce. It has such great flavor! Me too! I could drink it! YUM! This looks absolutely delicious and so pretty! I love all of the bright colors! Thai is our favorite too! I don’t make much at home, we usually go out for it, but I want to try this! We used to be like that too, but when I was pregnant I craved Thai food so much. I read everything I could find about Thai cooking and now I make Thai inspired food a lot. 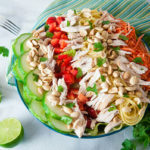 This thai chicken salad recipe looks so wonderful, I can’t wait to try it! Thank you for sharing your recipe! Me too~ it’s a rainbow in a bowl! 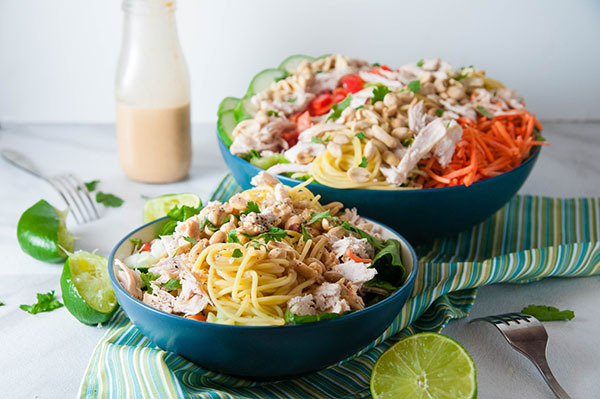 My husband and I just started liking Thai food and this salad sounds so delicious! I love salads and will definitely be trying this. Oh my gosh! This look AMAZING! I will definitely be making this! This looks amazing and seems pretty easy to make! Super easy to make- comes together in under 15 minutes. 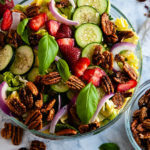 This looks so good, I love a good salad in the summer. I will have to try this out. I’ve been on a salad kick lately and this looks SO good! 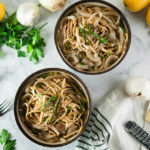 I’m going to have to make this– yum!